Between 1814 and 1831, the great French mathematician A. L. Cauchy created practically single-handedly a new branch of pure mathematics. Complex function theory was and remains of central importance, and its creation marked the start of one of the most exciting periods in the development of mathematics. 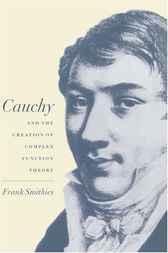 In this book Dr Smithies analyses the process whereby Cauchy created the basic structure of complex analysis, describing first the eighteenth-century background before proceeding to examine the stages of Cauchy's own work, culminating in the proof of the residue theorem and his work on expansions in power series. Smithies describes how Cauchy overcame difficulties including false starts and contradictions brought about by over-ambitious assumptions, as well as the improvements that came about as the subject developed in Cauchy's hands. Controversies associated with the birth of complex function theory are described in detail. Throughout, new light is thrown on Cauchy's thinking during this watershed period. This book makes use of the whole spectrum of available original sources; it will be recognised as the authoritative work on the creation of complex function theory.